Following the service, between 11:30 a.m. and 1 p.m., all are encouraged to stay for this month’s Messy Church event, “Eggstravaganza.” “Eggsperiments” and other “eggy” activities, including an egg hunt, will be offered as will a simple Fellowship Meal. A Last Supper meal and worship around the Community Table will be offered at the Maundy Thursday service on April 18, at 6:30 p.m. in the church’s Healton Hall. “We will have acoustic music and a variety of readers as we share in this intimate, special service commemorating Christ’s last week with his disciples,” says Pastor Francis. On Good Friday, April 19, the Chancel Choir will sing “The Weeping Tree” by Joseph Martin at the 7 p.m. service of Tenebrae. The purpose of Tenebrae is to recreate the betrayal abandonment and agony of the events of Good Friday. The service is left unfinished until Easter Sunday. LBUMC will host the 6 a.m. Easter Sunrise Service at Main Beach for the 24th straight year on April 21. At 10 a.m., Easter will be greeted with worship with music ranging from traditional to modern. Brass will herald the day, joined by guitar music. The Chancel Choir and JuBellation, the handbell choir, will perform. Pastor Francis’ sermon will be ”Finding New Life.” A rousing “Hallelujah Chorus” will conclude the service. To contact the church, call (949) 499-3088 or visit www.lbumc.org. Laguna Beach United Methodist Church is located at 21632 Wesley Dr, up the street from Gelson’s Shopping Center. Young filmmakers are encouraged to enter the World Oceans Day Video Contest to win a GoPro HERO and have their video featured on the One World One Ocean YouTube channel. Filmmakers are asked to share in a 60-second or less video what the ocean means to them. This is a chance for teens in grades 7-12 to channel their creativity. Humorous videos, music videos, and videos with a conservation message are welcomed. Awards will be given in the following categories: Judges Award Grand Prize Winner – Best Ocean Message, Public Choice Grand Prize, and Best Video from a Non-Coastal City. Video submissions are due by May 31. The Grand Prize Winner and two category winners will be announced June 14. To enter the contest, visit www.surveymonkey.com/r/CT9Y3BL. Laguna Canyon Foundation and four fellow nonprofits partnered with the Orange County Community Foundation (OCCF) to host Protect and Preserve, a Giving Day to sustain the ecosystems in Orange County, on April 10. The 24-hour online effort raised $75,685 with the participation of 194 donors for local organizations with a shared commitment of positively impacting the environment. The five nonprofits that participated in the Protect and Preserve Giving Day included Pacific Marine Mammal Center, Crystal Cove Conservancy, Laguna Canyon Foundation, Huntington Beach Wetlands Conservancy, and California Trout. The Orange County Community Foundation powered the Protect and Preserve campaign by providing seed funding to support the marketing assets, campaign resources, and collaborative partnerships. The Protect and Preserve Giving Day is part of a series that will take place in Orange County throughout 2019 as part of OCCF’s Collaborative Giving Day initiative to boost the capacity of local nonprofits to meet the community’s needs. OCCF first challenged Orange County residents to “give where their heart lives” during the inaugural iheartoc Giving Day in 2015, raising more than $1.8 million through 6,000 gifts to 347 participating nonprofits in just 30 hours. OCCF nearly doubled those results in 2016 during the second annual iheartoc Giving Day, receiving 7,000 contributions totaling $3.2 million for 418 participating nonprofits. In 2017, OCCF re-envisioned iheartoc as an expanded opportunity for nonprofits to connect with one another in support of their shared missions. The seven collaborative Giving Days held in 2018 raised a total of $1.4 million for local organizations. Additional collaborative Giving Days will be announced over the coming year. For more information, visit www.oc-cf.org/iheartoc. March 23 was Swallows Day in San Juan Capistrano. The celebrated, annual arrival of hirondelles (swallows to youse guys) may not be quite the exciting event that San Juan Capistrano promoters would like you to believe. When I had an office in Anaheim, with the improvement in service and my ability to advantage myself of really favorable fares for senior citizens (the world’s greatest “39-year-old” racquetball player admits to being in that category), I took to commuting in comfort on Metrolink several times a week. I usually caught the “5:58” from San Juan Capistrano, and with a free bus ride from the Anaheim station to our building next to City Hall in Anaheim, arrived at my then office at 7 a.m. It was terrific. I read my LA Times or a book on the train, and after the bus ride, entered the office ready to do battle. The service was “Deusche” punctual, and the cars were clean. It was a great deal. The only reason I did not use it five days a week was that on workout/racquetball game days I drove to work. On this particular day, I awakened quite tired from a brutal three games with a 22-year-old the night before. I won but felt the consequences. I decided to take the “7:01” instead of the regular “5:58.” Now, usually when I arrived at one of the town’s parking lots at the earlier time, mine was one of the first cars there. I could usually pick any spot I wanted. Not that day, however. The lot was full, and I had to drive around the area until I found a place. I did. It was on a street directly across from the lot, adjacent to an empty field. There were no trees, just the grassy field. I hurried to the station just as the northbound train arrived, boarded, and relaxed on the way to the office. That evening the “6:10 p.m. southbound” glided into Anaheim Station right on time. On my homeward bound trip I read my latest “read.” It occupied me seemingly for just minutes to the San Juan station. As I stepped down from the rail car, I hurried to beat my fellow passengers to the parking area. Everyone leaving the train at the same time caused a traffic jam even there. I pulled ahead of the crowd, somehow “made” the traffic light on Camino Capistrano (I was batting 1 for 30 beating that damned light), and headed to my beautiful, classic car. I was aghast. There it was, covered from one end to the other in slimy, dirty, disgusting, bird excrement. Now that car of mine was a 1978 Mercedes 300 CD. With its shiny blue sheen, its proud emblem pointing the way, and its truly classic, almost autocratic lines, it was one hell of a looker. I mean this baby was almost a family member. I had had it for some 16 years and ultimately put over 380,000 miles on it. As I carefully climbed in, trying desperately to find an uncontaminated spot, I almost threw up looking through those front windows. It was truly revolting. Why this particular auto I do not know. I must have parked near a nesting area or maybe the flock just did not like the shade of blue. The crazy thing was that mine was the only one bombarded. Gagging and barely able to see, I drove home. Instead of entering the garage, I parked near the garden hose at the side of the house. Without regard to chipping any paint, I hard-sprayed from front to back. An old towel applied vigorously helped remove the more stubborn deposits. However, scrub or not, the entire surface remained stained. Wet and disgusted, I gave up. In the morning (a Saturday) I drove to a car wash to finish the job. It took three run-throughs to eliminate all of the mess. From that day on, I took the earlier train. Plein Air painter artist Norman St. Claire is credited with establishing Laguna Beach as an Art Colony. The Laguna Beach Arts Alliance has made it an Arts Community. Created in 2002, the alliance is a partnership of 22 Laguna-based organizations dedicated to promoting a collaboration of artists and those who support the arts, including hosting the Art Star Awards, an annual event since 2007 at which those who create art and those who help make it possible join together to celebrate outstanding achievements and contributions to the arts in Laguna. “The Laguna Beach Arts Community continues to be blessed with an abundance of programs and supporters of the arts, each and every one of them deserving of special recognition for all that they bring to our community and all that they do,” said Rosemary Swimm, Art Star Awards chair for the second year. This year’s event was held at [seven degrees], as it has been since its inception. It was a joyful party. Award-winning actress Marcia Gay Harden added luster to the list of notable keynote speakers at previous events. Among them: Lee Rocker, Rita Rudner, Carl St.Clair, and Joe Mantegna. Harden spoke eloquently and sometimes hilariously, mimicking the gruff voice of her father, about the important role art plays in everyone’s lives and in particular, hers. “Well, first of all, I can’t imagine a world without it – I’ve seen societies devoid of creative expression, and that’s not a place I want to live, nor is it a place where beauty or humanity thrives. So I think it’s essential for those ignorant [of] art in all of its forms, to be educated on the variety and importance of art. She also shared her personal experience with art as a healer. “When I went through my divorce, I was not the woman to say ‘God closes one door and opens another,’” said Harden. “I was devastated, and as I realized I wasn’t being a very good mother, I took up some therapy. “One of the most profound moments I had was in an art therapy class, which was part of the program. I was asked to draw, on one side of a folded paper, what was my greatest sadness and fear. I did. Then, on the other side of paper, I was asked to draw how I would fix it. “Of course, I drew the dissolution of my family on one side, and the strength of me as a single mom with happy kids on the other side. In a moment, as I finished drawing and saw the two images join, I felt an electric shock of hope and possibility, and I know it was from having drawn this image, something which came from inside of me, rather than talking about it, as I would have done in more classic talk therapy. “I still have that picture hanging in a private spot in my closet. The presentation of awards followed the standing ovation given Harden. Three nominees and winners in seven categories were announced to cheers and applause. 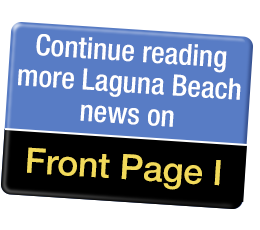 Laguna Art Museum’s 100th Anniversary Celebration, Laguna Beach Live! and Laguna Playhouse’s 2018 Year-round Seasons were nominated for Best Arts Program. The winner was LAM, presented by Joy Dittberner. Corporate Arts Patron of the Year honors went to the Moulton Company, announced by Dee Dee Irwin. Nominees were Mo Honarkar’s Laguna Beach Co. and the National Charity League. Riggie Horvath was named Individual Arts Patron of the Year. Willman J. Gillespie and LOCA’s Carla and Jeff Meberg were nominated. The Festival of Mosaics won the Outstanding Arts Collaboration award for the tile retaining wall, which involved 700 volunteers, led by Mike Tauber on behalf of LOCA Arts Education. The Festival of Arts Junior Art Exhibit and the Festival of Arts Halloween production “Pageant of the Monsters” were nominated. Laguna Plein Air Painter Association volunteer Toni Kellenberg was selected the winner of the Arts Leadership award, announced by Faye Baglin. LAM Curator Marinta Skupen and Tauber were runners up. Swimm presented musician Jason Feddy with the Artist of the Year Award. April Raber and Brittney Ryan were nominees. Volunteer of the Year was a new category this year. The deserving nominees were M. Charlie Ferrazzi, Lindy Narver and Sande St. John. Connie Burlin practically had to hog tie St. John to get her to attend the event. “When I looked at the nominees, I knew I couldn’t win,” said St. John. Deena Harros presented a flabbergasted St. John with this latest in a list of honors. If one were to look in a dictionary for a synonym for volunteer you would find Sande St. John. A special award for Lifetime Achievement in the Arts was presented by Festival of Arts board member Wayne Baglin to Scott Moore. The timing was right because Moore announced that he was retiring from the FOA board and from exhibiting at the festival. “After 39 years in a row, I thought I would try to see how life is in the summer without being on the grounds,” Moore said. Winners were presented with one-of-a-kind sculptures – Louies – created by local artist Louis Longi specifically for the Art Star Awards. “At the inception of the event, Sharbie (FOA publicist Higuchi), Sian (City Cultural Arts Manager Poeschl), Suzi (Arts Commissioner Chauvel) and I were sitting around saying we are going to do this award,” recalled Longi. The awards presentations were preceded by the announcement by Dora Orgill of the 2019 winner of the Seven Degrees of Inspiration $5,000 grant to Allyson Allen and a performance by Bridget Dolkas and Kurt Mortenson, winners of the 2018 grant.